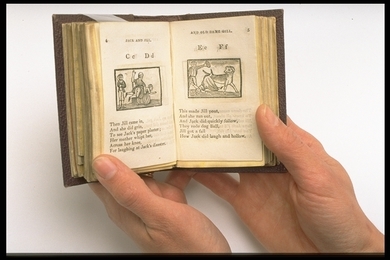 These small, inexpensive paper booklets, known as chapbooks, were the main recreational reading matter for the adult poor and children of all classes in the eighteenth century. Sold by traveling hawkers, or chapmen, the penny books had up to twenty-four pages and often included crudely printed woodcuts. Chapbooks were largely responsible in this period for keeping alive and transmitting traditional fairy tales, folklore, and nursery rhymes, and they served as a welcome alternative to the moralistic and didactic pamphlets of the time. They also signaled the beginning of a children's literature that accommodated a child's size and interests. The small pages matched tiny hands and budgets, and the illustrations appealed to a youthful imagination.